RDI actions under this theme will aim at developing products, processes and services that promote the competitiveness of the European water industry, thereby contributing to fuelling the European economy. The water industry sector is an important contributor to economic growth and job creation. Investments to reach full compliance with EU legislation have significant potential to create new jobs and growth. The waste water management in the goods and services sector represents more than 600,000 jobs, an annual production value of more than €100 billion and an annual added value of about €42 billion (investments, maintenance, operation, export of technology and knowledge). Investments in innovative technologies are essential to make the water industry more resource efficient and also contribute to job creation and economic growth. 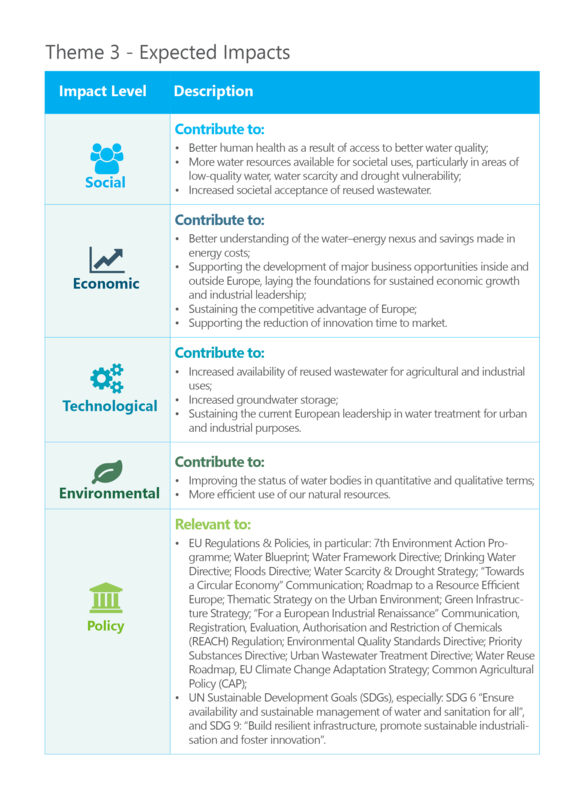 The Water JPI is committed to prioritising and funding problem-solving RDI supporting the development of market-oriented solutions in Europe and beyond. The Water JPI will seek cooperation with stakeholders at all levels to ensure that research results are swiftly transformed into business opportunities. Activities will focus on aspects, such as new materials and processes, management tools, Information and Communication Technologies (ICT), energy efficiency and supporting key enabling technologies (e.g. in the provision of clean water, wastewater treatment, etc.). Equally, the Water JPI is fully engaged in the identification and implementation of innovative governance solutions, as well as in removing existing barriers to the marketing of innovative products and services. RDI actions will also focus on social aspects, individual and collective perceptions, public acceptance and resource usage. The Water JPI will favour the transfer of solutions identified in case studies to other sectors and areas of Europe and the world. Ongoing monitoring of the 16 2015 joint call projects. Networking workshop between the 16 2015 joint call projects and other relevant EU projects/initiatives in 2017.
to Mitigate Impacts of Extreme Events (Floods and Droughts) at Catchment Scale.